Last Saturday, Nov. 10, football faced the Trinity Bantams and finished with an unfavorable result, losing 9-0. However, this was a strong performance and though it ended the season with a loss, it was a building block for next season. It was a close game throughout until finally Trinity was able to pull away. Both teams came in with strong defenses, with Trinity having the second strongest defense in the league, so it was unsurprising that both struggled on offense, but the real test for the Red and Black was on the defensive side of the ball. Going into the game, Trinity had the strongest offense in the NESCAC. Offensively, Wesleyan had to rely on their passing game. The Cards were stifled on the ground, only gaining 25 rushing yards throughout the game which is hardly ideal when handing the ball off 31 times. Both Matthew Simco ’22 and Sean Penney ’21 were heavily involved in the passing game, gaining 39 and 37 yards each. In addition, Dan Smith ’21 started his first game as quarterback of the Cardinals, throwing for 150 yards, but unfortunately he also threw two interceptions during the fourth quarter that really slowed down the Wesleyan offense. Trinity were kept well out of the endzone for the vast majority of the game, but the Bantams still found ways to move the ball against the Cardinals, gaining 226 yards. This was to be expected as the Bantams boasted the highest scoring offense in the conference and had been essentially unstoppable throughout the season, especially on the ground. 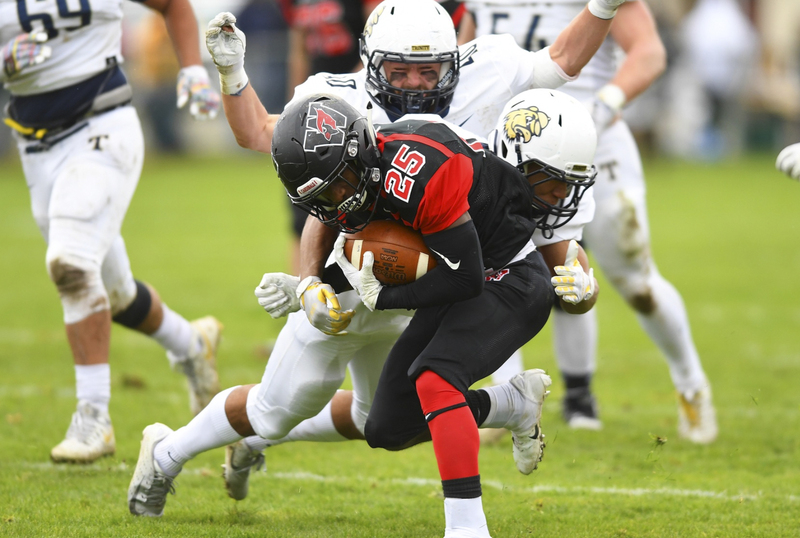 Trinity heavily relied on their running game to grind out their victory, but the Red and Black did a great job of finding a way to contain their rushing attack. Nonetheless, in the end, the Cards’ offensive attack was not enough to put up points, dropping the game to the now-NESCAC Champions, Trinity. The Cardinal defense did a fantastic job against Trinity. Holding an offense that scored an average of 42 points a game before their final match to only nine is incredible. The Cardinals forced seven punts, had five sacked, and forced two fumbles, recovering one. Brandon Morris ’19 stood out with 11 tackles and a sack, as well as Will Kearney ’20 and Grant Williams ’19, who both performed well and contributed a sack each. In addition, the Red and Black’s third down defense was great, stopping the Bantams on 10 out of their 14 attempts. The D also got two fourth down stops. Meanwhile, Trinity’s defense was playing lights out, with 2 picks and 8 sacks on the day, with three players gaining at least 3 sacks. Though it was definitely a performance to be proud of, there were still many of the same flaws that have been an issue for the Cardinals throughout the season. Even though Trinity punted seven times throughout the match, the Cards did not gain a single yard on punt returns. Similarly, Wes gave up seven penalties for 49 yards, which is again much better than many other performances throughout the season, but still considerably worse than Trinity’s 25 yards on penalties. A very noticeable improvement was on our third down conversion rate (39 percent or 7 of 18) which was impressive against a defense as potent as the Bantams. 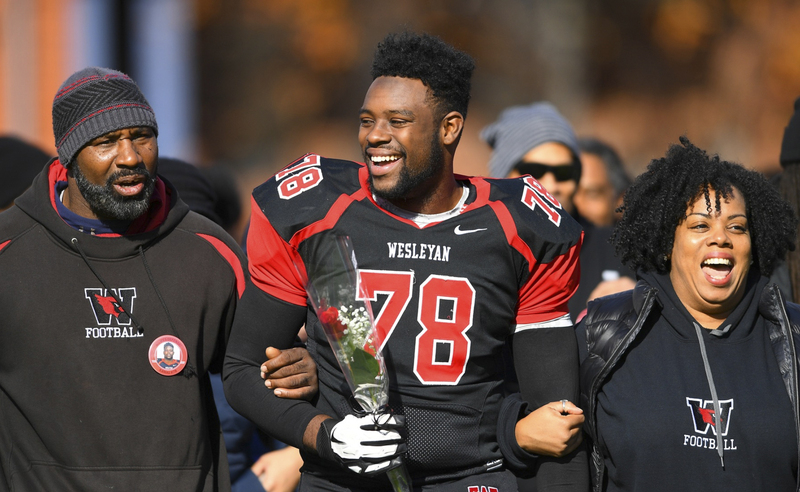 The NESCAC football season is now over, the Cardinals campaign finishing with a 5-4 record, despite a tough beginning to the season with two close losses. We’re going to be saying goodbye to a lot of senior players who have now played their last game for the Cardinals, and it’s a shame that we have to say farewell to these student athletes on the gridiron. But, looking ahead to next season, there are many bright spots with running backs Glenn Smith ’21 and Penney both returning for their junior years. Here’s to next season.